You can enter up to 30 courses. Next input field appears when you enter grade into last box. Check advanced mode for CGPA. If you're wondering what's your college GPA, wait no longer - our college GPA calculator is here for you. 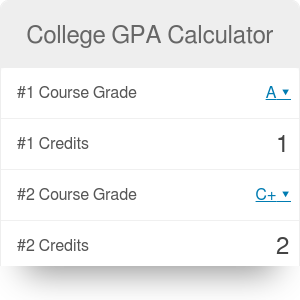 Type in the grades from your courses as well as credits you've got for each of them, and in no time you'll find your GPA. Not sure what GPA is or how to calculate college GPA? We're here to help. If you want to understand the college GPA scale and check out how 4.0 GPA scale looks like, jump to the next paragraph. Wondering what a good GPA in college is? Well, it depends (as always...), but we gathered some data on average college GPA, which can give you a small hint. Moreover, you'll find a paragraph with detailed step-by-step explanation on how to use this college GPA calculator as a cumulative college GPA calculator. Are you ready? Wait no longer, read on and try our calculator! If you're looking for calculation of GPA for college admittance, check out this useful high school GPA calculator - it works in a similar way, but it has more options on weighting the courses (like special weights if the course was really demanding, AP, IB etc.). Also, you may find the final grade tool useful - it helps in determining what your final grade will be, or what you can do to improve your result. GPA stands for Graded Point Average and it's one of the measures of students' achievements and academic performance. The calculation is done by converting the grades to a numerical scale and averaging them, according to given credits (weights). GPA may be calculated on the basis of grades from one semester, a year, or even your whole academic career. job interviews and admission decisions. Some schools give 4.3 score for A+ grade, so in that case, it's possible to obtain the final score exceeding the standard maximum 4.0 GPA. Although the values in the table are the ones most often used by academic institutions, the percentage intervals and the college GPA scale may differ between schools, so check out your school rules and statute. Assume we want to find GPA of our four courses, with different credit points. How to calculate college GPA manually? First, convert letter scores into numbers. Use the table from the previous paragraph. How to calculate it faster? Use our college GPA calculator! Select your grade for the first course. So it's 'A' for our first exemplary classes - Maths. Enter the class credits. Change the default value from 1 to 3. Repeat until all courses from the list are included. It's ok if you want to enter less than five courses - the calculator will ignore the blank boxes. Here you go! The college GPA calculator did all the maths, and the GPA value is displayed. If you don't have the credits for courses, leave the default value 1 - every course will be equally important, and not the weighted average, but standard arithmetic average will be used. With this calculator, you can also calculate your cumulative GPA. Just hit the Advanced mode button below the tool, and two boxes will appear - for your current GPA score and sum of credits you got. Coming back to the example from a previous paragraph: assume that we've just calculated the scores from the second semester, and we'd like to know what's the cumulative GPA after whole freshmen year. Assume that we finished first semester with GPA = 3.3. Type that value into Cumulative GPA box. During the first semester, we did courses for 16 credits. Enter 16 into Credits. Under the calculator you'll find the GPA (3.15) and also cumulative GPA, which is equal to 3.24 in our example. It's hard to pick one single number to estimate average college GPA. The grades are rising through the years (check out the great charts on grade inflation website), there are differences among schools, fields of study, gender, ethnicity, place of studying, to name only a few factors. If - after that introduction - you still want to see one number, here it is - average college GPA is around 3.15: 3.0 for public schools and 3.3 for private colleges and universities according to 2010 studies. A is now the most common grade in all types of colleges, and it's obtained more and more often. Grade point averages have increased around 0.1 points every ten years - in the 1950s, an average GPA was 2.52. You need to remember that the average college GPA depends a lot on the major: science majors tend to have lower GPAs than humanities majors (e.g., 2.78 and 2.90 are the average GPAs in Chemistry and Maths, respectively; whereas Education has a GPA equal to 3.36). Another critical factor is the school you're attending - highly selective colleges like Harvard or Stanford have higher average undergraduate GPAs than schools with high acceptance rate. You can read more about average college GPA topic on the Prep scholar website. Well, the answer for such question is quite obvious - it really depends. On your ambition, the college you're attending, your major and many other factors. Generally speaking, 3.0 GPA is a "B" mark - which stands for average. Many times it's the lowest score you can get to continue specific majors or courses. 3.5 GPA is often seemed as the above average, good or even very good result, but - as we said before - it may vary for your major and school. If your GPA is not as high as you would like it to be - don't worry so much, as a GPA score is relatively low on the employers' list. More important factors are internships and work experience, your major, volunteering, or even extracurricular activity. College GPA Calculator can be embedded on your website to enrich the content you wrote and make it easier for your visitors to understand your message.